Q: What type of support have you received from the country’s main political parties during the past few years? A: As I said before, over the past 20 years, all political parties have belittled our cries for empowerment, recognising our innate potential. Their one and only concern had been to make us continue to depend on charity and social welfare. Name me any politician who has raised his voice in Parliament over the past two decades for and on behalf of this near 20% of the population that forms the biggest minority group (disabled citizens), enabling us to enjoy our rights to live as equal citizens. We had high hopes that the elected politicians from several major parties, with whom we had worked closely, would take decisions on several key issues that concern the quality of life of these near four million people – People with Restricted Ability. Regrettably, this has not happened even after 20 years. As a result we remain often marginalised and deprived of equal opportunities concerning gainful employment, education, health, recreation and travel. This is one key reason which triggered our decision to contest. Q: Do you think this situation will change and if so, what support could you expect from them in the near future? A: Let me evaluate the present with an open honest, unbiased mind. Look at their manifestoes and what they have been talking about. They all seem to have The Dog in the Foundry Syndrome when it comes to the biggest minority of people. Rev. Madhuluwawe Thera, whom we respect highly, promotes a just society. Rathana Thero talks of a ‘Samata Pivithuru Hetak’. Mr. Gammanpila promotes a ‘Pivithuru Hela Urumaya’. Mr. Viyangoda represents a Purawesi Peramuna. The way a country and its leaders actually treats its population with restricted ability especially when it forms the biggest minority, is a true reflection of their attitudes towards the countrymen. It is a sure test and a far more telling indicator of society’s development than GDP. Two prerequisites for a formidable and sustainable National economy are arresting the colossal waste of human potential and minimising unwanted dependants. How can there be a just society when the biggest minority enjoys no justice of their rights to live as equal citizens? We are also a big part of the purawesiyo but the Puravasi Peramuna continues to overlook us. Our tomorrow is not at all clean and just any better than yesterday – not secured by any one of them who fail even to recognise us as a force that will win deciding votes. Mahinda Rajapaksa ruled the country for near a decade. His secretaries before and even now, had closed doors for us even to get an appointment to meet the king. Then and even to-date, he fails to realise this biggest minority. We will remain ‘keptflat on floor’ unable to rise with him. Prime Minister Wickremesinghe talks of a new Sri Lanka in 60 months but even in that new land, he has no plans to mobilise this big asset and empower our innate potential towards improving quality of life. In fact the Malik-Kabir committee of his failed to include written submissions in his ‘panchaprathipathi which King Lichchavis’ with a lion’s heart would never have thrown out. Those who have the wound only know where exactly the pain comes. Unless you open doors to talk with those who matters most and recognise the actual needs and priorities of this biggest minority, there cannot be a secured better tomorrow for us. "All political parties have belittled our cries for empowerment, recognising our innate potential. Their one and only concern had been to make us continue to depend on charity and social welfare"
This is the continuing stumbling block Mr. Anura Kumar and his bell team is hit with, which is very evident from the fact that they have grouped this near 20% of the population together with pensioners, making us two somewhat outdated coins and referring to us wrongly as those with a different ability. The JVP still has no plans known to the world, first to recognise us befittingly and then to resolve meaningfully the grave issues we face, which are also a growing threat to our economic and social development as well as the country’s human rights image. 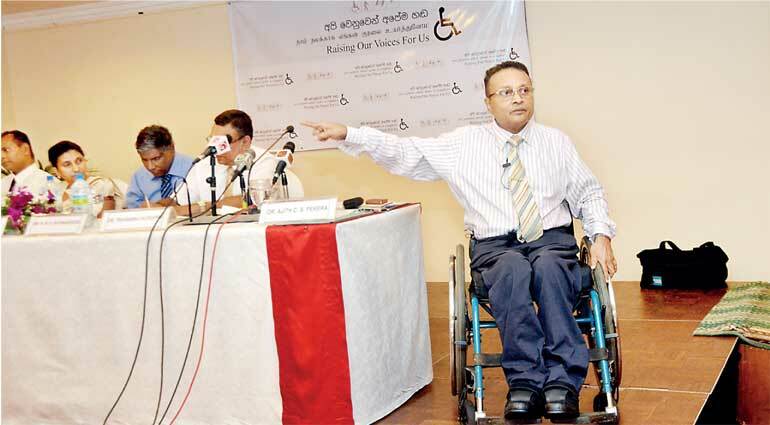 It is also regrettable that even His Excellency President Sirisena continues to overlook this biggest minority - people with restricted ability - and talks of Yaha Paalanaya, which is of no real value when his ‘paalanaya’ continues to often marginalise us, depriving us of enjoying our rights. The ability of everyone is only a temporary asset. No sooner that it reduces you fall down to the level of third-class citizens enjoying no right concerning employment, education, health, travel and recreation. Experience is the best teacher. It has taught us the bitter lessons. We have thus realised we cannot expect any politician from any party to empower and enable us. The biggest minority of Sri Lanka urgently needs to raise its own voice in Parliament. It’s the only effective remedial measure. It is the surest way for everyone, regardless of the degree of ability, to secure a better tomorrow for all to live with dignity as equal citizens. The only option and hope is not any politicians but to have our own true public servant in Parliament who understands our key priories. That is the very reason why we contest from Independent Group Number 12 under the desktop computer signage from the Colombo District.